T-Mobile CEO John Legere took the stage during a press event in Seattle on Wednesday evening where he hosted the "UnCarrier 5.0" event. During it, Legere announced a few changes that the carrier is making in an effort to become even more competitive in the wireless industry, and to attract new customers. So far, T-Mobile says it has attracted 17 million customers over to its network since it started its "UnCarrier" initiatives. One way the carrier is doing that is with a new option called "T-Mobile Test Drive," that provides you with an iPhone 5s and unlimited data for seven days, provided you allow a $699 hold on a credit or debit card. T-Mobile said it partnered with Apple to make the deal happen, and the initiative allows you to test the network and see if you like what T-Mobile offers. Customers interested can sign up for the test drive and start taking advantage of it on June 23. T-Mobile also said it's expanding its wideband LTE network to 16 new markets, where customers can grab theoretical data speeds up to 147Mbps down. Legere said that's a 90 minute HD video in 3 minutes, and said that's actually not just in testing demos – though we want to see those data speeds on an active network ourselves, first. VoLTE, the high-quality voice-over-LTE initiative, is also expanding to 15 markets today. Interested in test drive? You can try it for a bit soon, but there are some things you need to know about. You order the phone from T-Mobile's website but have to return it to a retail store. You'll need to drop down your debit or credit card and must return the phone within 7 days in perfect condition. If you don't, you'll be charged $699.99. It can't have a cracked screen, water damage, "Find My iPhone" active or damaged in any other way or you'll be charged a $100 damage fee. Still, there's zero cost to try out the network so long as you get it back in time. Also, you'll need to return the test drive phone no matter what. If you like it, however, you'll be sent a new one. The offer ends August 8 of this year. Hit the source below to see what Test Drive is all about. SEATTLE, June 18, 2014 – In another of its signature moves, T-Mobile US, Inc. (NYSE: TMUS) today introduced "T-Mobile Test Drive" and pioneered a new way to buy wireless in this country. With T-Mobile Test Drive, people can receive an iPhone 5s and unlimited nationwide service to take T-Mobile's network for a data-intensive, seven-day spin at no cost whatsoever. The Un-carrier's latest initiative takes aim at the painful process of buying wireless in America today. People must decide on a wireless provider without knowing how the network will really work for them — where they live, go to school, work, and play. As a result, the U.S. wireless industry has one of the highest "remorse rates" of any out there. Nearly half (46 percent) of wireless customers say they've signed up with a carrier and then wanted to leave, and one in 10 has actually left within the first 30 days of making a switch.1 It's a pain point ripe for an Un-carrier solution. T-Mobile Test Drive marks a new campaign to let consumers experience firsthand how the Un-carrier's network is different, even as the company today announced two massive network expansions. T-Mobile has expanded Wideband LTE into 16 total markets, giving all T-Mobile LTE devices a speed boost with capable peak network download speeds up to nearly 150 Mbps – that comes out to a 90-minute HD movie download in under three minutes or an 11-song music album in seven seconds. Building on its data DNA, the Un-carrier also expanded Voice over LTE (VoLTE) to more than 100 million people in 15 total markets. T-Mobile was the first major provider to launch VoLTE, and now, because its network has been designed for data, it is doubling the amount of data dedicated to voice calls for highest-fidelity, crystal-clear HD Voice and faster call setup times than ever before. The Un-carrier expects to deploy VoLTE nationwide by the end of the year. "The old telecoms designed their networks for a time when your phone's only app was a phone call — and they haven't shaken that dial-tone mindset," said Neville Ray, Chief Technology Officer for T-Mobile. "Our 4G LTE network was built in the last year and a half, so naturally we built it differently. We built it for the way people use smartphones and tablets today, and we built it with a mobile Internet architecture, so we could roll out new technologies faster." Now, as mobile broadband usage skyrockets, Un-carrier customers are reaping the rewards of a network designed to be data-strong and concentrated where people use data the most — unlike older carrier networks built by phone company utilities. T-Mobile customers are using more wireless data on average than the major national carrier customers — 61 percent more than Sprint, 69 percent more than Verizon, and 100 percent more than AT&T. T-Mobile customers also have more network capacity per customer than with any other national wireless company, a full 70 percent more network spectrum per customer than Verizon, and they're streaming, tweeting, using FaceTime and more at lightning speeds on America's fastest nationwide 4G LTE network. 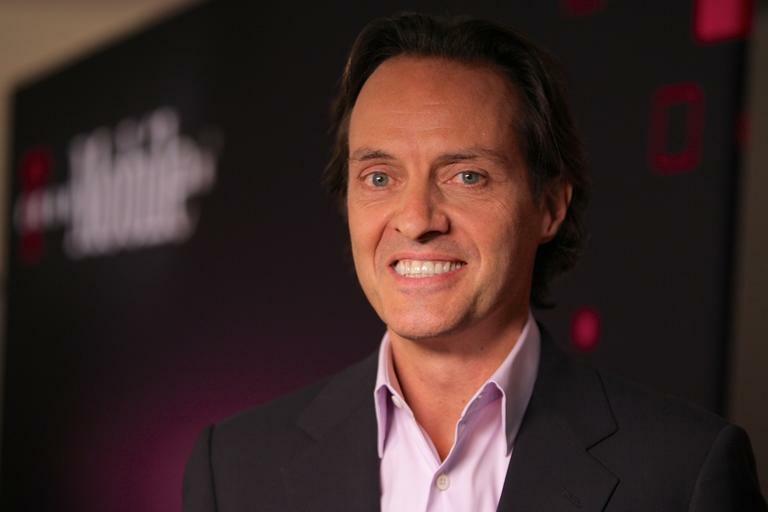 "We're a mobile Internet company competing against utilities, so it's no wonder we're faster than they are," added Legere. "We're out there doing it while the other guys are still scheduling a meeting to talk about doing it. And there's one more thing you can bank on. We won't stop." Learn more about T-Mobile's network expansion and data-strong network design in this blog post. For more information on iPhone, please visitwww.apple.com/iphone. For more information about T-Mobile Test Drive, visit t-mobile.com/testdrive or the T-Mobile Newsroom. Limited time offer; subject to change. Credit or debit card required for trial. Phone must be returned in 7 days to avoid $699.99 charge +tax. Trial use only. Service and account suspended after 7 days. Domestic use only. See T-Mobile.com for Test Drive Trial and coverage details. As America's Un-carrier, T-Mobile US, Inc. (NYSE: TMUS) is redefining the way consumers and businesses buy wireless services through leading product and service innovation. The company's advanced nationwide 4G and 4G LTE network delivers outstanding wireless experiences for customers who are unwilling to compromise on quality and value. Based in Bellevue, Wash., T-Mobile US provides services through its subsidiaries and operates its flagship brands, T-Mobile and MetroPCS. It currently serves approximately 49.1 million wireless subscribers and provides products and services through approximately 70,000 points of distribution, including approximately 8,000 T-Mobile and MetroPCS branded locations and 62,000 third-party locations, as well as distribution through our websites. For more information, please visit http://www.t-mobile.com. This news release includes "forward-looking statements" within the meaning of the U.S. federal securities laws. Any statements made herein that are not statements of historical fact, including statements about T-Mobile US, Inc.'s plans, outlook, beliefs, opinion, projections, guidance, strategy, expected network modernization and other advancements, are forward-looking statements. Generally, forward-looking statements may be identified by words such as "anticipate," "expect," "suggests," "plan," "project," "believe," "intend," "estimates," "targets," "views," "may," "will," "forecast," and other similar expressions. The forward-looking statements speak only as of the date made, are based on current assumptions and expectations, and involve a number of risks and uncertainties. Important factors that could affect future results and cause those results to differ materially from those expressed in the forward-looking statements include, among others, the following: our ability to compete in the highly competitive U.S. wireless telecommunications industry; adverse conditions in the U.S. and international economies and markets; significant capital commitments and the capital expenditures required to effect our business plan; our ability to adapt to future changes in technology, enhance existing offerings, and introduce new offerings to address customers' changing demands; changes in legal and regulatory requirements, including any change or increase in restrictions on our ability to operate our network; our ability to successfully maintain and improve our network, and the possibility of incurring additional costs in doing so; major equipment failures; severe weather conditions or other force majeure events; and other risks described in our filings with the Securities and Exchange Commission, including those described in our Annual Report on Form 10-K filed with the Securities and Exchange Commission on February 25, 2014. You should not place undue reliance on these forward-looking statements. We do not undertake to update forward-looking statements, whether as a result of new information, future events or otherwise, except as required by law.